The Eight Most Amazing, Educational Toys "For Girls"
I tweeted this photo to @AllenIverson. Sadly, he did not tweet me back. ... People are already talking about the next holiday -- my favorite holiday! Thanksgiving! But mostly what I'm hearing people talk about is Black Friday. It's natural to get swept up in sales and deals -- the world's best psychologists see to that. Many of us think buying things, whether for ourselves or others, can make us happy. (And, when done correctly, it actually can!) For others, it's a post-Thanksgiving tradition. 1. Slotwood. They're like life-size Lincoln Logs. Versatile, light and durable, slotwood will enable your child to build houses, castles, cars, planes... and anything else they can imagine. And then they can play in/around it. At $475, it isn't cheap. But it's a great way to help kids develop creativity and other cognitive skills -- not to mention motor development, which is an often-overlooked pre-literacy skill. Definitely more educational than an iPhone app. 2. Pool Noodles. If Slotwood is out of your price range and you're a little handy, you can create your own life-size Lincoln Logs out of pool noodles. Just order 15-25 (or more, if you want to get crazy) noodles, cut them in half and add notches on each side. Don't forget about the short connector pieces. One advantage to building with noodles versus Slotwood is that they're made of foam, so the risk of injury to the child (should they build a tall structure that falls) is smaller. For an authentic "wooden" look, wrap them in wood-print contact paper. Another DIY Slotwood alternative, if you have some amount of woodwork experience, is Builder Boards: How to Build the Take-Apart Playhouse. This book promotes collaboration, creativity, problem-solving and three-dimensional thinking. It will teach you to build the necessary boards for (or with) your children, and get them started with some ideas of how to use them. Easy to take apart, move and store, this is another great way to give the gift of hands-on, open-ended learning. 3.Roominate. An award-winning STEM toy, Roominate teaches hands-on problem solving and spatial skills, basic circuit-building and mechanical skills. It features connectable building pieces, so that different kits can be combined into a larger project. It's a little less open-ended than simple blocks, but was designed specifically with girls in mind -- you know, with pretty colors and a storyline and such. In addition to the Basic Roominate, you can also order the Chateau, Studio, Helicopter and more. And each part can be used to make different things -- for example, a motor with blades can be used to make a fan, a windmill or a lawnmower. 4. Elenco Electronic Snap Circuits, Jr. Kit. I haven't experimented with this kit yet -- but it has five stars and over 1,799 reviews on Amazon. What I like about it is that it seems intuitive, and features a snap-together design (so no gluing, soldering, etc.) It includes 30 parts, and can be used to make over 100 different projects. Perfect for kids in 2nd grade and up, it's won the National Parenting Center Seal of Approval, Dr. Toy Best of Education Products and Dr. Toy 100 Best Children's Products awards. And priced at $21, it's also a bit of a bargain. 5. Air Swimmers Remote Control Flying Clownfish. I wrote about these in a previous post,Good schools don't turn kids into zombies. Bad parents do. But I'm going to write about them again, because they're that cool. See? Your kids will be delighted... but so will you. It's pretty much one of those gifts you buy someone else that's also actually for you. If I had a roommate, this is what I would get her for Christmas. As a psychologist who did spent six months doing research in a nursery school -- as well as someone who's known a lot of incredibly talented engineers -- I've learned that playing with toys that fly gives children an innate sense of... forces. Of how things work. Of something that's hard to specifically identify, and probably even harder to teach. Which is just another thing to love about this product. 6. Little Passports. Because STEM is cool and important and everything, but so is being a true global citizen. Little Explorers is a subscription to a new country (or state) each month. Children aged 3-12 receive a package in the mail with a letter from Sam and Sofia, a souvenir from the country of the month, and worksheets, activities and codes for online games. 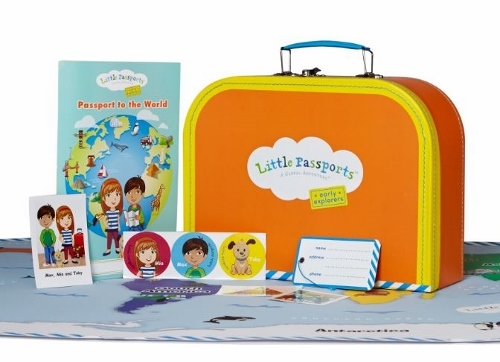 I've always felt that my most valuable learning experiences happened through travel and cultural exchange, and Little Passports is a great way to get kids excited about the world around them. Female role models -- and they're not even pink! 8. GoldieBlox. I'm reluctantly adding this, as I have mixed feelings about the product. On the one hand, it's got a storyline and characters, so it's not building for the sake of building, which, apparently, girls like. On the other hand, research shows that open-ended play allows for more engaging and imaginative learning -- and as far as I can tell, there's a "right" way and a "wrong" way to assemble these kits. Which means girls will gain some amount of problem solving and spatial awareness, but it's probably not the richest possible experience for them. On the third hand, it's good to have role models who zipline and build things, rather than await their prince. So that's my two-cents on the topic of Black Friday/Christmas shopping for young girls. Did I miss anything? Let me know in the comments!